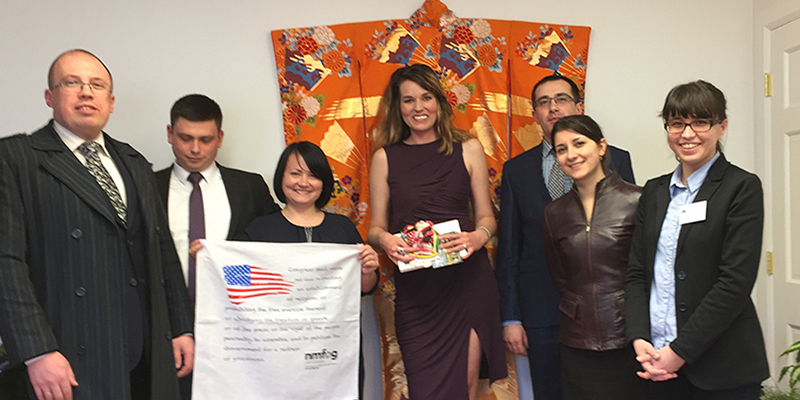 FOG’s Shannon Kunkel was honored to have the opportunity to speak with visitors from Ukraine on Thursday. The visitors were in Santa Fe as part of a program offered by the Center for International Relations and the U.S. State Department. They had a range of experience and came from various cities within Ukraine, but most were employed in the government or legal sector. The visitors were interested in learning about government accountability in the United States and in New Mexico, specifically. We enjoyed sharing our perspectives on transparency, the First Amendment and sunshine laws. Being a citizens of a relatively young democracy, the Ukrainians were particularly curious about how our laws work in practice and how we balance the right to know with the right to privacy and potential safety concerns. They asked questions about how we uncover and prevent corruption in government and how we persuade elected officials to embrace transparency. All great questions that FOG tries to tackle every day! This program helps to create cultural understanding between nations and gives us the rare chance to help spread the values of democracy. The Ukrainians were even kind enough to bring gifts for FOG – a doll wearing traditional clothing from their home country, Ukrainian chocolates and a postcard with facts about their nation. It was a great experience to share and learn from one another, and we appreciate being asked to participate! ← Previous Previous post: Campaign Finance Reporting Bill is Off to the Governor’s Desk!